For purposes of this policy, “suppliers” and “third-party hosted storefront” refers to the brands of products we offer. Products we offer may be available directly through this. The bulk of our products are available via our storefront via the brand/company website of the brand/company who produces and/or manufactures the product you’re interested in. These storefronts are accessible via product links. Like many other Web sites, https://RedConradsWellnessAlternatives.com makes use of log files. These files merely logs visitors to the site – usually a standard procedure for hosting companies and a part of hosting services’s analytics. The information inside the log files includes internet protocol (IP) addresses, browser type, Internet Service Provider (ISP), date/time stamp, referring/exit pages, and possibly the number of clicks. This information is used to analyze trends, administer the site, track user’s movement around the site, and gather demographic information. IP addresses, and other such information are not linked to any information that is personally identifiable. This information is only collected for purposes of completing your order and following up about your order. In some cases this information may be passed on to our suppliers of products you order if we are currently out of stock and need to have it shipped directly from the supplier. This information may also be used to setup customer accounts on our supplier/third-party storefront sites; or representative accounts if you apply to join our team. All payment information is either handled directly through our suppliers/third-party storefronts or PayPal. We do not collect any payment information, such as Credit/Debit card numbers. Should you email us, you’re name and email address may be added to our list whom we send sales, promotions, updates, and other offers to. You may opt-out of such emails by responding with a blank email to any such email with the term ‘UNSUBSCRIBE’ in the subject line. Should you leave a positive review, whether by email, phone, the website, or social media, it may appear on the website in the Testimonials section under your First Name & Last Initial. We do not sell, or otherwise distribute, any of your information to any third-parties. Your information is strictly used for purposes of customer orders or adding you to our team. → Google’s use of the DART cookie enables it to serve ads to our site’s visitors based upon their visit to https://RedConradsWellnessAlternatives.com and other sites on the Internet. https://RedConradsWellnessAlternatives.com has no access to or control over these cookies that are used by third-party advertisers. https://RedConradsWellnessAlternatives.com does not knowingly collect any personally identifiable information from children under the age of 16. If a parent or guardian believes that https://RedConradsWellnessAlternatives.com has in its database the personally-identifiable information of a child under the age of 16, please contact us immediately (using the contact in the first paragraph) and we will use our best efforts to promptly remove such information from our records. This policy does not apply to any information collected offline or via channels other than this website and our social media. 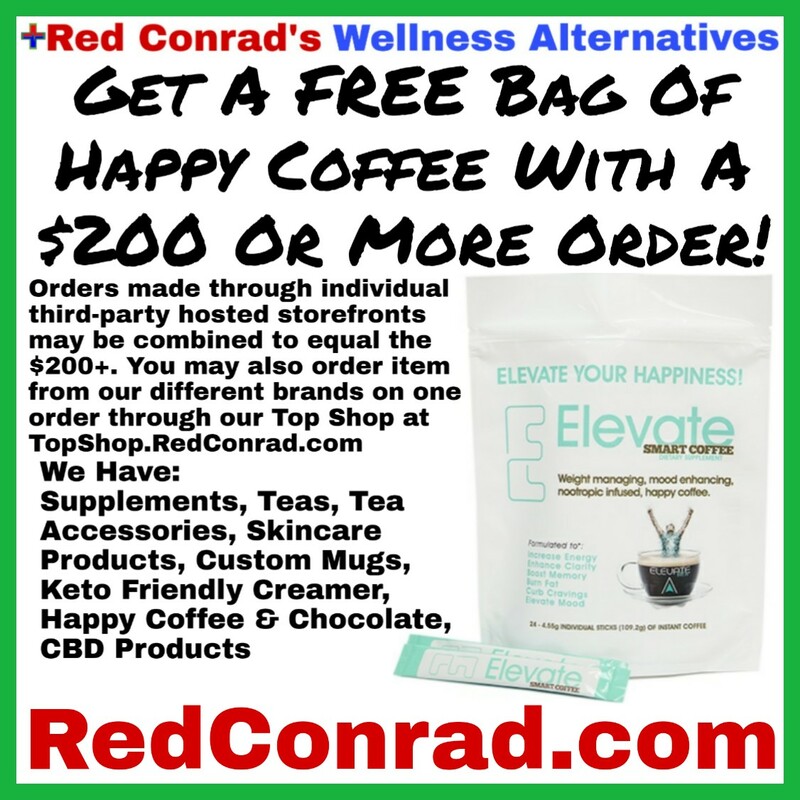 Our Wellness Community (Community.RedConrad.com), which is currently hosted on Facebook, is a closed group. All information you share in the community stays in the community. No stories, information, images, etc you share in the community will be shared outside of the community without your express consent. You will not be contacted outside of the community, or added to our newsletter, without your consent. Please email Red@RedConrad.com or message Red on Facebook if you find another member is sharing your info without your consent, or is sending you solicitations or other messages without your consent. The community is a private support community, all members should be able to feel safe there.